2012 vs 2013 - When Do Homes Come on the Market in Charlottesville? You are here: Home / Albemarle / Comparing 2012 and 2013 – When Do Homes Come on the Market in Charlottesville? 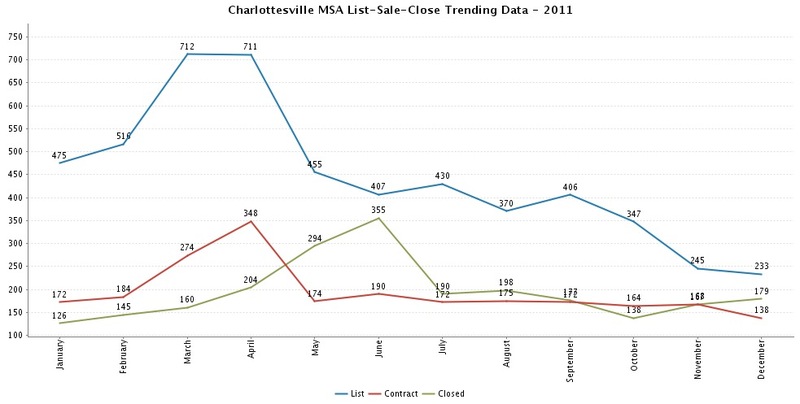 Comparing 2012 and 2013 – When Do Homes Come on the Market in Charlottesville? Let’s look at some numbers. 2011 was interesting, with the new listing bump breaking the traditional mid-year inventory decline right after the start of the autumn school year – a trend that occurs every year. So â€¦ how’s 2013 looking? – The contract peak was in May of this year versus April of 2012 – As I said in my monthly note recently, the frenzy of the early spring filled with hope and confidence was tempered early. – Inventory levels for 2013 are pretty much on track – across the MSA – with 2012. The differentials between 2013 and 2012 are fascinating. Look at the peak in Contracts. – I’m speculating that the increase in inventory in July/August is due in part because some sellers saw the hope in the market and success their neighbors were having in selling and thought that now would be the right time for them to try to (finally) sell. I don’t care what you might read – interest rates rising have impacted consumer psychology, home sales and home prices. I can’t yet quantify any of these three, but I will. If you want to see the raw data, ask me. These charts confirm what I always believed that the vast majority of homes come on the market in the spring. So that means that if a buyer can find a home they like and are willing to move in the winter, they will most likely get the best prices since these homes have been on the market the longest.